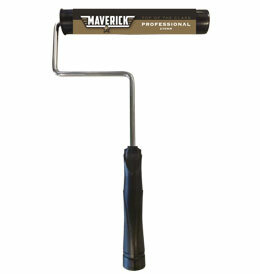 The Maverick Range of roller frames are high quality frames designed to meet both the needs of the professional painter and also the DIY painter. A professional quality frame with easy roll bearing and a chrome plated steel shaft. It also features a removable stainless steel roller cage frame – 5 wire with a sturdy and comfortable moulded grip and universal thread suitable for Maverick extension poles. Available in 230mm and 270mm.